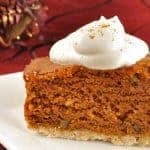 A moist, spicy cake with a crumb crust, classic gingerbread spices and a hint of flavor from good Kentucky bourbon. In a large bowl, combine the flour, sugar, ground walnuts, ginger, cinnamon and cloves. Using a pastry blender or fork, cut in the butter and blend until combined and crumbly. Scoop out a cup of the crumb mixture and gently press it into the bottom of the prepared baking pan. Add the baking soda and salt to the remaining flour mixture and blend well. In a separate bowl, whisk together the molasses, pumpkin puree, egg, buttermilk and bourbon. Add to the dry ingredients and mix thoroughly. Spread the batter evenly over the crumb mixture and bake for 35 to 45 minutes, or until the cake pulls away from the edges of the pan and a toothpick inserted in the center comes out clean. For best flavor, be sure your ground spices are very fresh. Ground ginger loses its potency rather quickly, so buy small quantities and replace frequently.